Several weeks ago General Electric announced they would be divesting themselves of their subsidiary, General Electric Capital Services, over the next two years. The company kept a positive spin on the move, saying “the future of GE is as an industrial company,” glossing over what is a colossal failure on the part of a company that should have made much better financial investments. Although the company is attempting to raise its per share price, GE should never have been involved in what was essentially banking to begin with. The financial giant was drawn in, not to promote GE Industrial or build the strength of the company, but to boost executive salaries. They entered the business of borrowing lots of money to buy other debt investments. This is called leveraged trading—the activity that caused Goldman Sachs to have to borrow $600,000,000 from the Federal Reserve Bank during the financial crises of 2008. GE Capital has been, and remains, an incredible millstone around the industrial firm’s neck, crippling GE with debt and risk. In 2012, I published a special report in National Legal and Policy entitled: Why Immelt Needs Obama. In this piece I detailed GE’s ugly financial truth. To go to the roots of the problem, we need to go back to 1995. Business publications were touting opportunities at a GE subsidiary, General Electric Capital Services (GECS), which was a bank almost all but in name. Financial statements at the time made it appear as though GECS was the main reason for parent GE’s profitability. Yet the truth was it was not. And it was willful obfuscation that created this illusion. 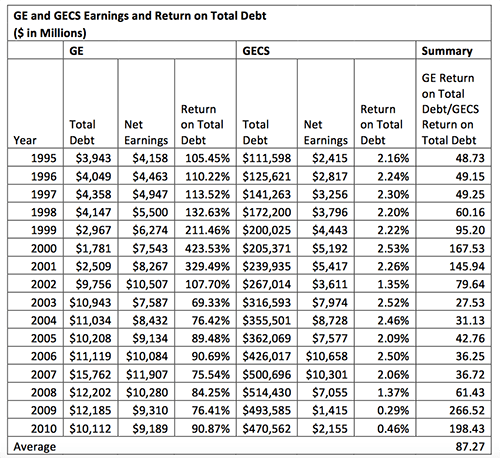 GE Capital actually took on enormous debt that has only ballooned over the years. In a chart comparing the earnings and total debt, I showed just how unsustainable their position truly is. Look at the comparison of returns on total debt assigned to GE Industrial and GE Capital Services. Here you should focus on the columns “Return on Total Debt” for GE (the industrial company) and “Return on Total Debt for GECS” the finance company. And so, General Electric needed and got a government bailout. General Electric said Wednesday that the federal government had agreed to insure as much as $139 billion in debt for its lending subsidiary, GE Capital. This is the second time in a month that G.E. has turned to a federal program aimed at helping companies during the global credit crisis…. The F.D.I.C. program covers about $139 billion of G.E.’s debt, or 125 percent of total senior unsecured debt outstanding as of Sept. 30 and maturing by June 30…. Last month, G.E. started using a new Federal Reserve program aimed at reviving demand for the commercial paper for a wide variety of companies. But, in spite of this you have to see how Jeffrey Immelt prospered while the stockholders of GE were pummeled. In 1992 GE had about $37.9 billion in sales and a net profit of $4.3 billion. The stock price ranged from $7.30 to $6.10 share with an average of $6.70. By the time Welch retired, GE’s market cap at $60.50 per share was 10 times larger than in 1992. This is an extraordinary accomplishment by anyone’s standard. His compensation, justifiably, doubled during his last five years. It’s hard to say the same thing about his successor. Jeffrey Immelt’s total compensation for his first year was $6.387 million, the same as for Welch’s last year. By 2006, his salary would increase $17.863 million, or 2.8 times that…Immelt’s total compensation by the close of his sixth year actually exceeded Welch’s final total compensation of $16.246 million. Can you believe this? Next we will show you how Warren Buffett makes huge profits from government guarantees, and also how Goldman Sachs went broke! You can read my full analysis from 2012 at the National Legal and Policy Center’s website, here.